Reading and share top 6 famous quotes and sayings about Belial by famous authors and people. 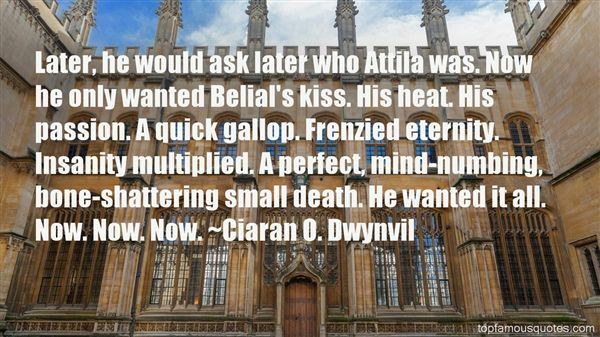 Browse top 6 famous quotes and sayings about Belial by most favorite authors. 1. "I cling unto the burning Æthyr like Lucifer that fell through the Abyss, and by the fury of his flight kindled the air. And I am Belial, for having seen the Rose upon thy breast, I have denied God.And I am Satan! I am Satan! I am cast out upon a burning crag! And the sea boils about the desolation thereof. And already the vultures gather, and feast upon my flesh." 2. "All the demons of Hell formerly reigned as gods in previous cultures. No it's not fair, but one man's god is another man's devil. As each subsequent civilization became a dominant power, among its first acts was to depose and demonize whoever the previous culture had worshipped. The Jews attacked Belial, the god of the Babylonians. The Christians banished Pan and Loki anda Mars, the respective deities of the ancient Greeks and Celts and Romans. The Anglican British banned belief in the Australian aboriginal spirits known as the Mimi. Satan is depicted with cloven hooves because Pan had them, and he carries a pitchfork based on the trident carried by Neptune. As each deity was deposed, it was relegated to Hell. For gods so long accustomed to receiving tribute and loving attention, of course this status shift put them into a foul mood." 3. "Later, he would ask later who Attila was. Now he only wanted Belial's kiss. His heat. His passion. A quick gallop. Frenzied eternity. Insanity multiplied. A perfect, mind-numbing, bone-shattering small death. He wanted it all. Now. Now. Now." 4. 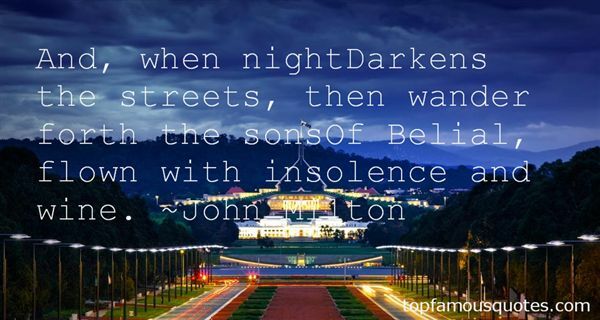 "And, when nightDarkens the streets, then wander forth the sonsOf Belial, flown with insolence and wine." 5. 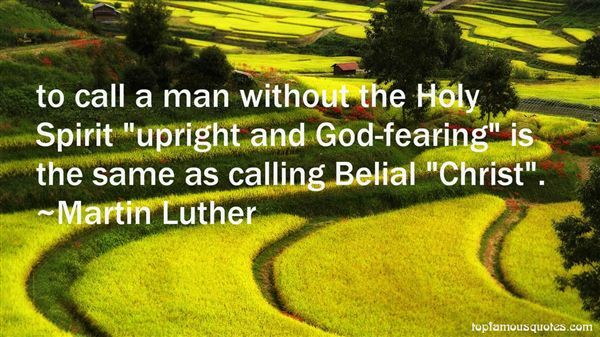 "To call a man without the Holy Spirit "upright and God-fearing" is the same as calling Belial "Christ"." 6. "In our world, love is most certainly a weakness." ~ Belial"
Sleep is not on good terms with broken hearts. It will have nothing to do with them."